Please note that all of our live insects can only be purchased in lots/quantities of 250 via our website - e.g. 250, 500, 750 and so on. If you require a custom amount of any of our live insects, please contact us by phone on (07) 5533 8375 or by email at sales@livefoods.com.au to process your order any further. Whilst we do freight reptile livestock around Australia (excluding Tasmania), it is subject to relative import/export wildlife permits for each state/territory. We will also need to confirm that the purchaser carries the appropriate license for the specie(s) they are attempting to purchase. In saying that, once your order has been placed, you will receive a phone call from the Livefoods Unlimited staff in order to process your enquiry any further. Note: Shipping costs will not be calculated, and no reptile livestock orders will be dispatched until after we have made contact. If you have any further questions or are unsure about any of the above, please contact us prior to placing an order for live insects and/or live reptiles. 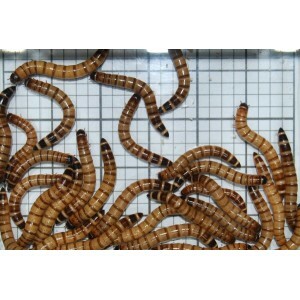 Bulk orders of medium live crickets purchased in lots of 250. These have been the mainstay of commercial insect production for decades and are still the preferred food for birds, reptiles, amphibians, fish and insectivorous mammals and invertebrates. They are fast growing, reaching maturity in just six weeks at ideal temperatures, nutritious when raised on the appropriate diet, hardy and relatively easy to handle. Livefoods Unlimited crickets are sold in four sizes pinhead, small, medium and large. Pinhead crickets are traditionally new hatchlings but at Livefoods we believe they are more useful for most animals at around 7-10 days of age when they are about 2-3mm in length and have increased their nutritional value by consuming a quality diet for a few days. Small crickets are generally 5-8mm in length, mediums 10-15mm and large around 15-20mm after they have gone through their final moult and developed wings. All adult crickets have wings but they are folded away neatly beneath the dark brown wing covers on the back and are rarely used except if jumping and gliding down from a significant height. Winged adult crickets are not able to fly upwards and they are not as adept at climbing smooth surfaces so they are not as escape prone as cockroaches, although they are prodigious jumpers so it is a good idea not to build up their hiding places too close to the top of the box if no lid is used.